They assure me it can be a gerund, and as such a ‘Dinning Bar’ could be either a place for making a din- such as karaoke, or a place for dinning lessons into people through repetition, like an English conversation school. Both of these could be good bets and are very popular in hip international areas like Shimo-Kita, but there are already Japanese words for both of them, so I’m not optimistic. Could the ‘Dinning Bar’ be a tribute-bar to the Dinning sisters? I know their soulful groove of 50’s country mixed with Southern Baptist jazz might not be to every hip young Shimo-Kita-goers taste, but there are plenty of oddball Murakami-types out there, wilting away in their solitary apartments smoking jazz cigarettes and waiting for the Big Jazz-Daddy to come swoop them into his bosom. They might like a Dinning Disters bar. But, probably not. But as you can see- they defer responsibility for interpreting their own name to the reader. ‘It’s all in the domain name’? Pshaw! Come on! At least Ronseal can say that and it makes sense. Dinning.net with it’s legions of befuddled Stumblers must all be scratching their heads at this obtuse gag of a ‘description’. Dinning Hunter Lambert and Jackson were surprisingly helpful, gave me cream tea, and I think it was Jackson who actually patted me on the head in an affectionate fatherly manner. Of Dinning I caught scarcely a glimpse but for this high-speed photograph in which he is posing in a dapper grey suit. I hadn’t even realized he was there while I took the photo, as he moves with superhuman speed. There was no chance to interview him, as I was told he is very shy- but I suppose it’s possible he runs a bar in Shimo-Kita on the side of his big law firm in Canada. If anyone knows the truth behind the Dinning Bar, I’d be keen to hear about it. You can see my other Ads/Signs articles in the Ads/Signs Gallery. If you like this post, why not click one of the bookmarking links below to let other people know about it? Thanks! I guess the explanation that it is a simple spelling mistake would be, well, too simple? Nice research on the word “dinning.” I learned something. 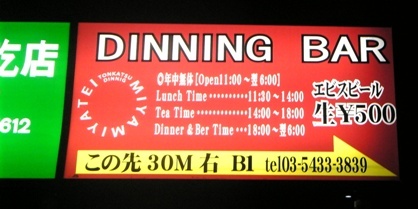 I’ve also got a dinning pic on my Japangrish page. The dictionary entry is really hard to read, has it been compressed? Check it in IE on your computer. I’m turning UK Mike into an elitist, hopefully he doesn’t care about IE users, as I don’t. That photo looks fine in Safari and Firefox (both Mac versions). You know, maybe you can get decent “dinning” at the Yokohama Wedding place advertising its “Gland Mariage”. Maybe they added an extra N. Maybe it is a Dining Bar. Curt- Would I marry a gland? Hmm. Which gland would be the best fit for me? The pancreas is a funny color (and makes bile, doesn’t it? ), so rule that out as gross. Pituitary is in the brain, a bit messy. Probably all quite messy. Think I’ll pass. Tornadoes and Jason- Try telling your ‘extra N’ theory to ‘Dapper Dinning’ in his flamboyant grey suit. See what kind of response you get. Though you’ll be lucky to catch him at all, as he moves so fast and is so shy. Liver makes bile, stores it in the gall bladder. Pancreas is grainy and gross looking – I can link you to dissection photos on my teaching site. Definitely the extra n was a mistake, like all the other bonerisms you see on Engrish dawt com. Can’t believe none of you guys thought of the most obvious, attractive and useful gland..
That’s right fellas the mammary gland…. Hmm, the mammary gland, yes. The only problem with that might be that they come in pairs, like Siamese twins. I know that sounds good for a bit of a frolic- but wait til you’re married to them both, the nagging would never end.